Jet Set Travel Saffiano Leather Slim Bifold Wallet BLACK. Details:saffiano leather ,bifold style,signature lettering logo in front. Composition: Saffiano Leather. a proof of authenticity and for our financial purposes. SIZED FOR TODAYS SMALLER BAGS, FULL FUNCTION, DEAL 4 U! Jet Set Travel Flat Slim Bifold wallet. Black with Gold tone hardware. Crossgrain leather. In good used condition. Wallet only. Magnetic snap pocket. 1 x Clutch Bag. You may also like. With zipper closure, portable size, easy to carry. Rate (item arrived). Style: F24808. Pebble Leather. 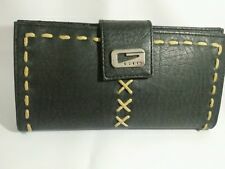 Zip Around Wallet. Color: IM/Black. Size: 4.5"(W) x 4"(H). 1 bill fold slot. 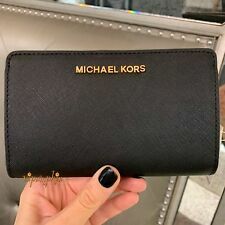 Kate Spade wallet. Black with Gold tone hardware. 6 credit card slots, 1 billfolds, zipper change pocket. 3.75" H x 4" L (fold). BLACK LEATHER. 1 LARGE SLIP POCKET. ID WINDOW. ZIP AROUND CLOSURE. 100% Genuine Coach Wallet or Your Money Back. Zip pocket. Genuine crossgrain leather. Snap closure. We set our prices at the lowest level possible. Therefore, we will not be able to reduce our price.